Hey folks, I know its been a while. 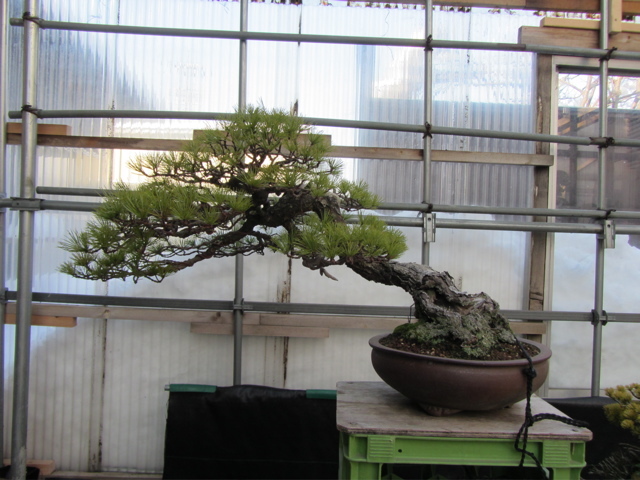 My gracious sempai Mike Hagedorn was nice enough to do a post about my recent work here at the nursery of Shinji Suzuki, and because of that act of kindness I gained a few new friends here at Reelbonsai. Since I used up all of my good “before and afters” of Juniper on Mike’s blog (Crataegus.com) I had to get creative. Today was a scorcher, mid 90’s with too much humidity, so in between watering and other daily apprentice tasks, I was asked to re-adjust a white pine that I had wired a year before. My teacher bought it from a client, it had grown leggy and out of proportion. Although I don’t have a before pic, here is what this old guy looked like after my first wiring on it. After the first styling last winter, not bad for the first go, but some things just didn’t seem balanced, maybe a little too heavy in places, maybe one or two unnecessary branches, something just didn’t click with the final image at the time, and boy would this tree explode with new growth throwing everything way more out of control… once again, I was not thinking and didn’t get a before pic of how this pine looked prior to my revision today, I think all the sweat that dripped into my ears today somehow got into my brain… so here’s how it looked all spruced up after a couple hours of readjusting. It actually looks like a different tree, thats the fun part about white pine, when the new growth finally hardens off after months of arduous pin point watering; don’t want the needles to get too long and white pine don’t like a lot of water. One time a day heavily in the morning from the time the new candles begin to elongate, about the end of July. An old thin tree like this requires a pretty good deal of pre-determined contemplation. 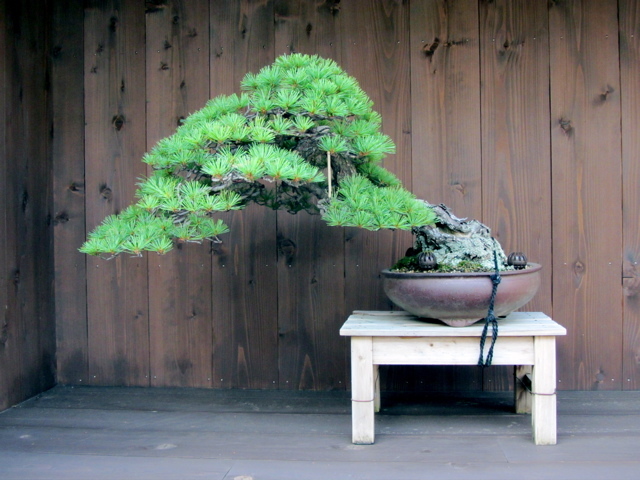 Like any species or style of Bonsai, you want to show off or highlight certain characteristics. This is a bunjin, so the first thought in ones mind should be “compact” and having more separation between the smaller foliage pads. You might notice that my first attempt didn’t quite live up to this philosophy, the branches don’t seem very interesting and don’t compliment the movement of the trunk, and the tree overall was still not very compact. It became apparent that a branch in front up near the apex was too heavy, by removing it and lowering some of the main branches really allowed me to close everything in and the new design became worthy of the trees age. Hope you enjoy the new look, it was a fun challenge and a good excuse to get out of the heat! This entry was posted in Uncategorized on August 7, 2013 by reelbonsai. Brian McGrath here. We met at your nursery in the spring. I had such a great time that afternoon watching as you ,Tyler , Shinzi and the other apprentice ,sorry I forgot his name, when you guys potted up the huge red pine that sits at the entrance to the nursery.how was the beer. What are your plans for the near future. When are coming home to start your own nursery. What will be the theme of your place. I am excited for you. When you get yourself organized I will come down to portland to see what you have become. Also what is Tyler up to. How much longer will he apprentice. I will make the trip down to the Artisans in 2015 for sure. By the way I took some pictures of the potting up of the pine. If you wan’t them send me your email address as they are on my iPad and that’s the only way I know how to send pictures. Until the next time take care of yourself and I will see you when you get back. what a transformation, looks as if it is a different tree. great job! Thank you I look forward to being back finally, come visit!